Let's take a look at what's popular on the ladder! This deck is asking all the questions in the best of one format and it's up to our opponents to have the right answers. The reason this deck is even more efficient now is because it got a cheap way to find action in Light Up the stage and more ways to deal three damage in Skewer the Critics. If your opponent stumbles in any way, then it's usually lights out for them. The best ways to combat this is chunks of lifegain and a real clock in something like a Wildgrowth Walker. 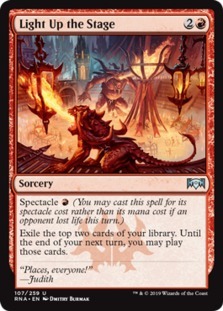 You can also combat these decks with spells like Moment of Craving and whatnot but there will be a certain point a red deck player will hold back on all of their creatures to prevent you from gaining life and just force you to counter all of their burn spells. Of course there's always Revitalize and spells like Absorb which are absurdly helpful when you're in the hot seat. 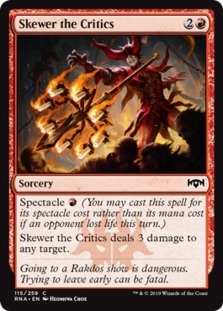 This card is continuing to live up to the hype it got in spoiler season. Having multiple copies of this means we can stack the triggers which does unfortunately take some time to tap all of your mana each trigger as you have to put it into full control mode and tap each land individually. Right now there are a few flavors of control and Esper is currently the most popular as I don't blame people for wanting to play it. Mortify may be one of the most important cards right now for a control deck. 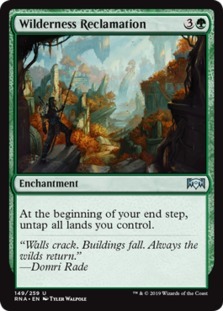 It answers Rhythm of the Wild, Wilderness Reclamation, Search for Azcanta, Experimental Frenzy, and a ton of other enchantments along the way. At the very least, it's still a creature removal spell. 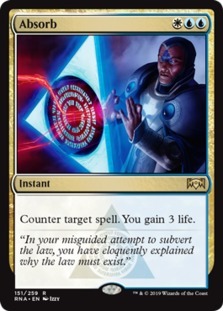 The Esper variants and most other control decks have opted to leave Sinister Sabotage behind because of how much the 3 life matters off of Absorb right now. As I said though, there are still variations of control outside of Esper. 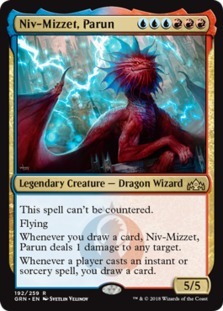 I've been running into a fair amount of Jeskai Control decks as Niv Mizzet, Parun and Teferi, Hero of Dominaria still go together like peanut butter and jelly. They pair well together and are very efficient at closing out a game if the opponent untaps with them. Jeskai control is definitely the most aggressive of the two popular decks right now so don't feel like your Jeskai cards are entirely pointless. If you want to beat these decks right now, look at Golgari decks splashing blue for Negate or Frilled Mystic and Hydroid Krasis as those decks countering back is brutal for the control gameplan. Also being able to get back your Hydroid Krasis with cards like Find // Finality is hard to beat as it will grind the control deck out of answers. Especially since Krasis doesn't need to resolve to draw cards. Mono U tempo is a tough matchup for Jeskai Control as you operate mostly at sorcery speed with your board wipes but a simple Spell Pierce or two can prove to be fatal. Don't leave your house without enchantment removal and some way to gain life. 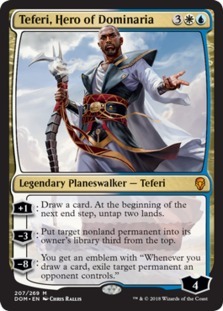 Otherwise, this standard format is absurdly fun and MTGRNA has only added more power to the format. This is one of the best standards in awhile, and I really want to say thank you to the play design team and everyone involved as there are a million (exaggeration) decks to play and there are even powerful budget decks. Seriously though, guildgate decks are cheap and out there winning. What a wonderful time to be playing standard best of one or best of three, doesn't matter to me. It's all good.